Unlike other WordPress hosting reviews, we do not recommend anyone hosting company because what makes ‘BEST‘ for you depends on your particular goals, preferences, and resources. So, we have created this post to simplify your web hosting search; putting together the most popular 10 WordPress hosting company reviews as fair as we can. While creating this list of best WordPress hosting services, we have undergone an in-depth thorough research. We have kept various factors determining the quality like speed, storage space, ease of use and customer support in mind. Therefore, no doubts these are the top 10 web hosting companies for WordPress. Now, selecting the best out of best is your job. Do not panic! We have made it really simple. 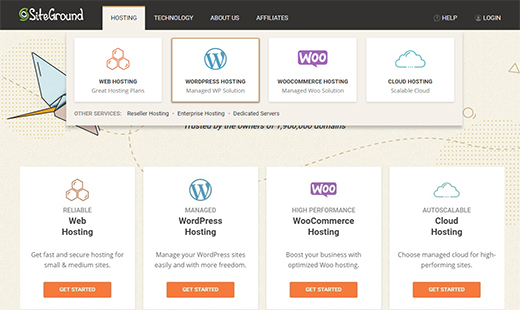 Hold on until you read this full comprehensive WordPress hosting comparison. WordPress being the most popular content management system offers plenty of web hosting choices. You can choose from free hosting to WordPress specific managed WordPress hosting. Below are the major types of hosting services for WordPress described briefly to help you choose a hosting company easily. WordPress is open source free software that comes in two flavors officially: WordPress.com and WordPress.org. The major difference between these two WordPress platforms is ‘hosting’ i.e WordPress.com is a free hosted platform while WordPress.org is a self-hosted platform. Yes, the hosting provided by WordPress.com is free WordPress hosting. You can create a WordPress website completely FREE in WordPress.com free hosting but there are limitations. You have limited control and customization possibilities. In addition, it displays advertisements in your site and in case you want to remove them, you have to pay. So, free WordPress hosting may be a good choice for you if you want to establish an online business or enterprise. However it is a good platform for the beginners, seasonal bloggers to start a personal blog/ website FREE and with ease. All the hosting services discussed in this post are paid hosting services for WordPress.org or self-hosted WordPress platform. If you want to learn more about the difference, view this post: WordPress.com Vs. WordPress.org. *Similarly, there are other free WordPress hosting providers that have limitations like their ads on your site which you cannot remove. Shared web hosting is the cheapest and most popular option available. With shared hosting, multiple websites share the same IP address and resources of the server including the memory, hard disk space, and the bandwidth. The advantage of shared hosting plan is the low cost – ideal choice for the low-budget projects and beginners. However, there are some disadvantages like limited memory space, slow site speed, SEO and security issues as there are multiple sites hosted on the same server and use the same IP address. With VPS (Virtual Private Server) hosting, you will be provided a certain portion of resources on a server. You will share a server with other VPS users but there are not as many as in Shared hosting. Server resources are allocated to the VPS users according to their needs. Therefore you can get more resources like space and memory anytime you need at an additional cost. Hence, it’s a good choice for quickly growing business websites. It is costlier than shared hosting however it is a good solution for more secure hosting. Failure of other VPS users to protect the security of their sites on the server doesn’t harm your site. Dedicated hosting refers to a hosting configuration where all the server resources are devoted to a single client. Unlike shared hosting and VPS hosting, dedicated hosting is used by a single user. You can use the full hard disk space, memory, bandwidth, while you have the full control over security, speed, and SEO aspects. Dedicated hosting is very expensive compared to the Shared hosting but it is worth it if you have a large online enterprise hit by a very large number of the audience every day. Managed WordPress hosting is a relatively new technology developed in order to provide hassle-free hosting services specifically to the ever-increasing WordPress users. It is the WordPress-specific hosting service that hosts only WordPress based websites. Managed WordPress hosting services take care of the most of the technical tasks of your WordPress website including CMS updates, automatic updates, security, website performance etc. Additionally, they offer dedicated customer support which makes managed WordPress hosting an ideal solution. Managed WordPress hosting services are costlier than Shared hosting plans however considering the ease of use and time they save, it is worth its cost. If you want a summary of the web hosting types, here it is. Free WordPress hosting is not ideal if you want to start an online business. It is suitable for learners; a platform to get familiar with WordPress. Shared hosting is the cheapest solution while there are some compromises including security and performance. VPS hosting is costlier than shared hosting and also comes with more promising features. Dedicated hosting is not at all shared like ‘Shared’ and ‘VPS’. Therefore, it’s tougher by security and better for performance. It is expensive. Managed WordPress hosting is hosting plus management solution keeping users away from a bunch of essential tasks. It is quite expensive however the finest solution if budget is not an issue. Despite all, here is good news for WordPress users! Most of the WordPress hosting companies now provide essential WordPress specific features including easy install and setup in low price. Read the full review below for more information. 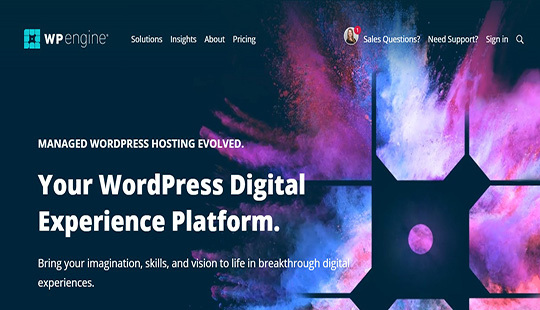 Take a look at the highlights of the best WordPress hosting services 2019 in the table below. Now, let’s go to the full review of each WordPress hosting service. Bluehost is yet another WordPress hosting company officially recommended by WordPress.org. However, there are some rumors on the web about its degrading quality. Despite the rumors, it can be trusted for its years of experience in making WordPress hosting better and easier. WordPress and Bluehost have been consistently working together since 2005 aiming at creating an ideal hosting for WordPress platform. Bluehost comes first if you are looking for high-quality cheap WordPress hosting solutions. It is the cheapest of all the hosting services compared here. The starting plan ‘Basic’ is available for just $2.95/mo. 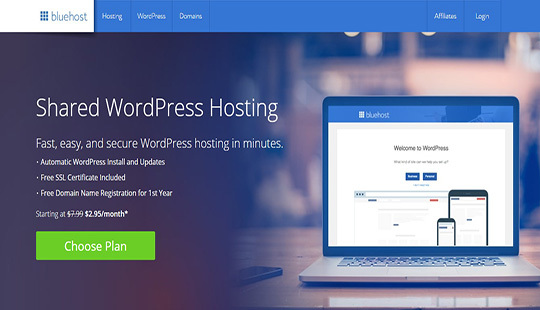 Bluehost features mainly three WordPress hosting plans. Take a look at the hosting plan highlights. Price: $2.95/mo. Price: $5.45/mo. Price: $5.45/mo. Bluehost also offers 24/ 7 support via phone, email or live chat. User queries are answered by the WordPress experts and professionals instantly. Our Take: Bluehost is the right WordPress hosting platform if you are going to start a low-budget online project. 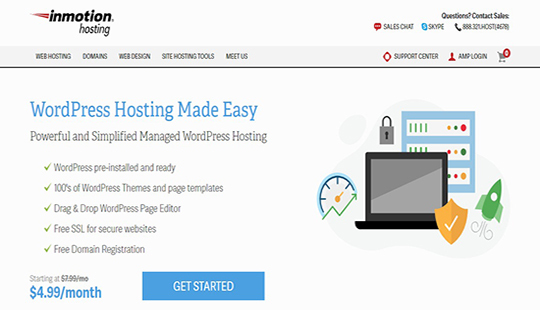 InMotion Hosting offers one of the best web hosting for WordPress platform. With InMotion hosting, your website will be hosted on the powerful web servers and expert WordPress hosting support will be provided. They offer WordPress-Optimized web hosting that includes several technical and management features. It includes pre-installed and ready WordPress, free site transfer, drag and drop support, hack and malware protected, free data backup, more than 200+ free themes etc. Most importantly they have a wide range of instant customer support channels like phone, chat, email and even Skype. Also, InMotion Hosting offers a BONUS feature for marketing. You can get up to $150 credits for FREE advertising in Google, and other search engines. InMotion WordPress hosting services are available in low prices like SiteGround and A2 Hosting, starting from $4.99/month for ‘WP-1000S’ plan which is suitable for startup. Although, InMotion offers altogether 6 WordPress hosting plans. For now, let’s take a look at the top 3 InMotion WordPress Hosting plan highlights. Price: $4.99/mo. Price: $8.99/mo. Price: $11.99/mo. InMotion Hosting provides fantastic customer support from fanatics for WordPress. Support is available 24/7 via live chat, phone, and email. Our Take: InMotion Hosting is the best hosting for WordPress for its cheapest starting plan cost, support to 2 websites and unlimited space. 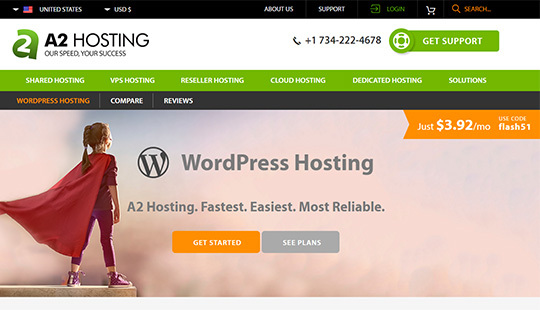 A2 Hosting is yet another reliable WordPress hosting provider for 2019. They offer fine-tuned and blazing fast hosting service along with dedicated customer support. 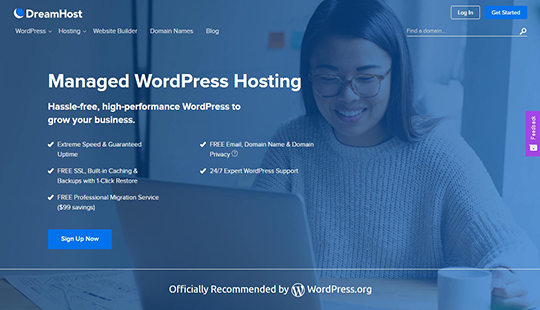 The A2 Optimized WordPress web hosting comes with pre-installed WordPress so that users don’t need to worry about downloading and installing the software. Also, it provides auto-configuration so as to provide the best level of site performance and highly secure settings. A2 Hosting is an accomplished company recognized and awarded with different titles in the hosting industry. You can get hosting plans starting from $3.92 at A2 Hosting. A2 Hosting offers mainly three types of WordPress hosting plans. Take a look at the highlights. Price: $3.92/mo. Price: $4.90/mo. Price: $9.31/mo. A2 Hosting offers friendly and dedicated support from a knowledgeable team which it calls ‘Guru Crew Support’. You can contact them 24/7/365 for any type of support queries. They answer customer queries via support tickets, email, phone, and Skype. Customer support is quite awesome at A2 Hosting. Our Take: All of the A2 Hosting plans offer unlimited web space and unlimited bandwidth which is quite impressive. Hostinger is fast, reliable and cheapest WordPress hosting providers in the hosting industry. It is best for small companies, businesses, or start-ups with a very low online budget. Hostinger WordPress package offers much more value and benefits you could possibly require on a shared hosting package at a much more lower cost. Hostinger is one of the few web hosting services providers that have “true 99.9%” average uptime. 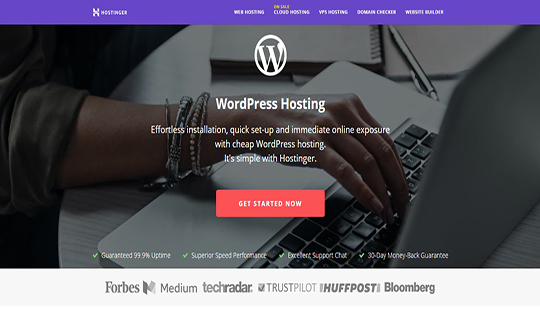 Hostinger is the right WordPress hosting platform if you are going to start a low-budget online project. It is the cheapest of all the hosting services compared here. The starting plan ‘Basic’ is available just for just $1.45/mo. Hostinger features mainly three WordPress hosting plans. Take a look at the hosting plan highlights. Price: $1.45/mo. Price: $2.95/mo. Price: $3.95/mo. Hostinger offers round-the-clock support and makes knowledge base articles available for you via a widget in each page of the hpanel. If you cannot find a solution there, you can contact their support agents via live chat, email, or online ticket. Our Take: Hostinger comes first if you are looking for high-quality cheap WordPress hosting solution. SiteGround is no doubts one of the best WordPress hosting providers available today. Thousands of WordPress users love its awesome customer support, blazing speed, and tough security. It is one of the four officially recommended WordPress hosting companies by WordPress.org along with Bluehost, DreamHost, and Flywheel. SiteGround offers feature-rich managed WordPress Hosting at a low price, ‘StartUp Plan’ starting at just $3.95/ month which is indeed a great value. Furthermore, it comes with all the essential WordPress features that make your task much easier and also save lots of your time. SiteGround features mainly three WordPress hosting plans. Take a look at the hosting plan highlights. Price: $3.95/mo. Price: $5.95/mo. Price: $11.95/mo. SiteGround boasts of its 24/7 fast and dedicated support to its customers. Support is provided to the users in three mediums: Support Tickets – Reply within 10 minutes, Live Chat, and Phone. In conclusion, customer support seems amazing at SiteGround. Our Take: SiteGround is the perfect solution if you are looking for a quality managed WordPress hosting at a low price. WP Engine is the industry leader in the managed WordPress hosting. It is a WordPress specific hosting company just to empower WordPress users. WP engine does everything best to keep the WordPress websites highly scalable, speedy, and secure. In addition, it provides professional WordPress support to its users. WP Engine ensures the best and latest technology including one-click WordPress staging and restore, built-in CDN, enhanced security direct SFTP etc. It is backed by full-time professional engineering team and dedicated labs team. WP Engine offers mainly 5 types of managed WordPress Hosting plans. They have not mentioned the price of Premium plan and Enterprise plan on their website, so the three hosting plan highlights are given below. Price: $35/mo. Price: $115/mo. Price: $290/mo. WP Engine offers expert support to the customers. Most noteworthy, the WP Engine support is also recognized in the industry; it is 3 times Stevie Award Winner for the best customer service. They are available 24/7/365 for the user queries. Our Take: WP Engine’s starting plan ‘StartUp’ costs $35/month which seems quite expensive in comparison to the above three hosting services. However, it’s worth a value if you want the BEST WordPress-perfected hosting. HostGator is a well-known name for website hosting and now one of the best hosting providers for WordPress platform as well. Users love HostGator for its services which are as per its commitments. It guarantees 99.9% uptime along with 24/7/365 support. HostGator comes up as a convenient and simple hosting solution for WordPress users of all levels. Basically, there are three hosting plans of which users can choose as per their needs. For example: Starter plan is perfect for the startups who want to host just one website. HostGator features mainly three WordPress hosting plans. Take a look at the hosting plan highlights. Users are provided with ‘superior support’ at HostGator. WordPress Cloud Hosting experts are available 24/7/365 for customer support. 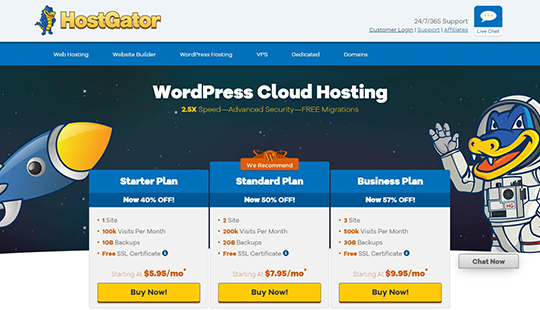 Our Take: HostGator is a good alternative to the other hosting solutions for WordPress. DreamHost is another dependable and high-quality WordPress hosting provider. It offers both shared WordPress hosting and fully managed WordPress hosting ‘DreamPress’. DreamPress plan is available at $19.95 per month which is for sure a reasonable price for the features it offers. It takes care of software updates, daily backups, WordPress-specific security, and performance providing the user a sound sleep. That’s not all. Shared hosting also seems really useful and feature-rich. It allows unlimited resources like disk storage, bandwidth, domains, email accounts etc. It offers two plans; shared hosting and fully managed WordPress hosting named as ‘DreamPress’. Take a look at the DreamHost hosting plan highlights. You can trust DreamHost for expert support. They offer 24/7 support to the customers through live chat, support tickets, and phone. Our Take: DreamHost hosting plans are comparatively more expensive yet they offer worth value. Undoubtedly, GoDaddy is a distinguished website hosting provider which powers thousands of giant websites online. GoDaddy has always been like a big daddy offering quality web hosting services at the cheap price. Good news for the WordPress lovers, it has feature-rich WordPress hosting plans at lower prices. It offers mainly four kinds of hosting plans from which users can choose as per their needs. WordPress auto-install feature, bullet-proof security from hackers, and site performance some benefits you will enjoy with GoDaddy for hosting. GoDaddy features mainly four WordPress hosting plans. Take a look at the hosting plan highlights. Price: $8.99/mo. Price: $12.99/mo. Price: $19.99/mo. Price: $24.99/mo. Bandwidth: 25K visits/mo. Bandwidth: 100K visits/mo. Bandwidth: 400K visits/mo. Bandwidth: 800K visits/mo. GoDaddy proudly boasts of its award-winning support team. It provides 24/7 support to the customers via phone, community forums, and live chat. Our Take: GoDaddy is a great hosting solution for your WordPress website if you are looking for a professional and experienced company. It is the biggest hosting company in this list. Flywheel is yet another officially recommended WordPress hosting service by WordPress.org. It is a WordPress-specific hosting company that hosts only WP websites. Moreover, it is a beautiful WP hosting and management service built for beginners, designers and agencies. Flywheel WordPress hosting ensures rock-solid security, high website performance and awesome support from the professional support team. The Flywheel dashboard is unbelievably simple and clutter-free. It actually looks beautiful while being very easy to use. Flywheel has mainly two types of hosting plans named as Pay-Per-Site and Bulk Plans. However, if you want a custom plan or 10+ site plans, you can contact them. Bandwidth: 5,000 visits/mo. Bandwidth: 150,000 visits/mo. If you have any issues while using this hosting, you can instantly start a support ticket. In addition, they provide support via phone and online chat. 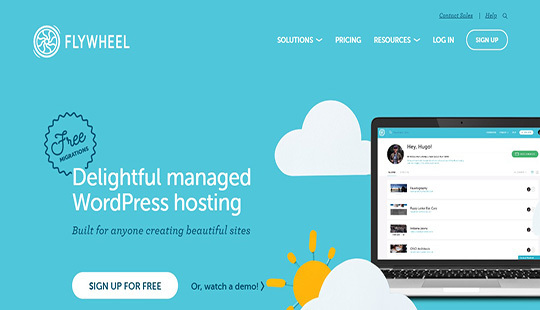 Our Take: Flywheel is awesome managed WordPress hosting provider and a good alternative to WP Engine. If you have already used one of the above-mentioned hosting services, please share your experience with us. Our readers may get more idea from your feedbacks. Have any thoughts on this article? Feel free to comment below. Thank you for providing such a valuable piece of information. I am visiting your blog on daily basis.